At Barre Tire we love anything that involves recycling and reusing. Especially when it comes to avoiding having to send unwanted tires to landfill or to the furnace. So scrub down those old tires and grab a can of spray paint to create colourful, innovative and eye catching features for your garden. You may need to go to an arts and hobby shop or even and auto shop to get the best paint for spraying on rubber. If the tires are going to be in direct sunlight or in hotter climates you will need a good flame retardant spray. Lay single tires and fill with soil to keep your flowers and plants elevated from the ground. If you are planning to use your raised flower beds as a part of a kitchen garden then you need to ensure that the rubber does not become too hot, so keep them in a cooler area that does not get prolonged periods of direct sunlight. 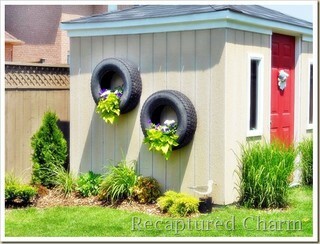 To create planters simply stack and secure a few tires on top of one another and fill with soil. This is a favourite trick of many landscape gardeners when doing a garden redesign on a budget. We love this idea. Hang one or more smaller tires vertically along a garden fence or side of a shed using a length of chain or rope. Fill the lower third of the tire with soil and set your hanging plants or flowers. Use bold colours, or contrasting colours if you are creating more than one to create a fun statement that the kids will love. Another idea that the kids will love! Hang the tires from a secure and suitably strong frame. There are two options – you can either hang the tire so that it hangs vertically or horizontally. Just make sure that the tires are adequately secured with rope or chains. Pile a few tires on top of one another and secure them to each other. You can then transform them into seats or tables. There are endless options and lots of great ideas for recycling old tires. And make sure to get the kids to help too. I’ll be a great way to educate them about recycling, hone their artistic skills and perhaps peak their interest in gardening at an early age.